1. Prepare the biscuit. Separately, mix the dry ingredients — starch, flour, coconut, salt. 2. Beat the eggs at the highest speed mixer for 1 minute, add the sugar and beat until thick, creamy 7-8 minutes, the mass became a lush and airy. In two-three stages introduce the dry ingredients (from now on use the mixer is strictly prohibited! ), Stir gently from the bottom up movement of a wooden or plastic spatula. 4. Prepare the souffle. Cheese rub on a small grater. Cream put on low heat, add the vanilla and slightly heated. 5. There also send the grated cheese and whisk stir until it dissolves. Add half the rate of sugar and 2 tablespoons of flour, stir quickly. Add the butter, remove from heat. 6. Enter one egg yolks in a chilled mass, beat with a mixer until smooth. 7. Beat the whites with the remaining half of sugar and lemon juice until stable peaks. Add a couple of tablespoons to egg-cheese mixture and mix very carefully to protein is not settled, add the remaining whites and mix again. 8. Turn on the oven to 150 ° C, put the tray with water. Split mold lay a parchment, cut strips and lay a side. At the bottom of the mold put a biscuit, pineapple rings on top. Fill the soufflé. Bake on the 2nd level of the oven for 1 hour 15 minutes. I bake 40 minutes at 150 ° C, then turn down to 140 ° C or even 35 minutes. Ready cake did not immediately take out! 9. Turn off the oven and let it stand for 20 minutes more, then opened the door and leave for another 30 minutes. Put in the fridge for the night right on the form. The next day, carefully remove from the mold. 10. 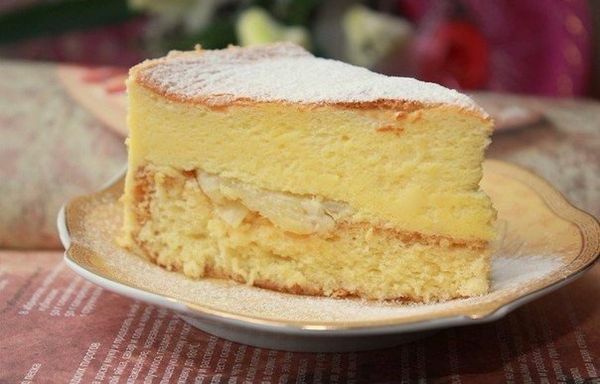 Decorate the cake with powdered sugar.